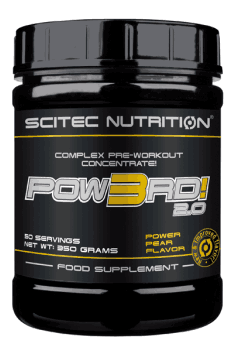 SCITEC Pow3rd! 2.0 is an advanced pre-workout supplement consisting of two patented blends: DualCreatine and Sp3cial. It efficiently increases energy levels, delays the occurrence of tiredness, increases nitric oxide (NO) levels, and regulates cellular pH, that way contributing to increased exercise capacity of the body. The product helps to maintain proper focus and motivation during training and helps to reduce muscle damage. Micronised creatine monohydrate – creatine with a water molecule subjected to the process of micronisation (making its particles smaller), thanks to which it can be easily and efficiently transported to the skeletal muscles. It provides a phosphate group for the resynthesis of adenosine triphosphate (ATP) out of adenosine diphosphate (ADP), that way making it possible for the body to produce energy more efficiently. ATP plays the role of a multitasking coenzyme and the carrier of energy, which is crucial for the course of many processes in the organism, including muscle fibre contractions. Creatine citrate – a compound of creatine and molecules of citric acid, which is an intermediate in energy production in the Krebs cycle. It dissolves very well in water and helps to regulate cellular pH, preventing the occurrence of premature muscle tiredness. The synergistic activity of the molecules constituting creatine citrate efficiently increases the ability of cells to produce energy. Thanks to that, muscle strength and power visibly increase along with their endurance and capability of long-term work without the feeling of fatigue. Beta-Alanine – a compound of the amino acid alanine and histidine, it increases carnosine levels in the body. Carnosine is an acceptor of hydrogen ions formed as a result of muscle work. If their concentration reaches too high levels, they change pH in cells and lead to the feeling of muscle fatigue and “burning”. The maintenance of proper pH in cells allows the right course of biochemical processes, enabling longer or more intensive physical activity. L-Arginine hydrochloride – stimulates the production of nitric oxide (NO), responsible for the dilation of the lumen of blood vessels, enabling more efficient blood flow in the body. That, in turn, allows higher workout intensity and lower energy expenditure, as better blood flow means better oxygen and nutrient transport to working muscles. Supplementation with arginine has a positive effect on the growth of muscle mass, as it improves insulin sensitivity in tissues and can promote post-workout growth hormone (GH) release, which, in turn, increases the rate of muscle protein synthesis. Caffeine – a purine alkaloid with ergogenic properties, it stimulates the release of catecholamines and prolongs their activity. Catecholamines, such as dopamine, adrenaline and noradrenaline, are responsible for the mobilisation of the system by increasing the activity of the sympathetic nervous system, which includes effects such as a higher heart rate, dilated pupils and bronchi. Moreover, caffeine inhibits the activity of adenosine in the brain by binding to its receptors and that way reduces the feeling of tiredness and fatigue. The use of caffeine efficiently increases muscle strength and endurance, enhances aerobic capacity, delays fatigue, and stimulates the release of fatty acids from adipocytes. Acetyl-L-Carnitine (ALCAR) – a form of the amino acid L-carnitine enriched with an acetyl group that enables its permeation through the blood-brain barrier. L-Carnitine supports mitochondrial function and enables the transport of medium- and long-chain fatty acids to mitochondria so that they can be used for energy purposes. ALCAR can improve the efficiency of the nervous system and provides an acetyl group for the production of acetylcholine (ACh). ACh is an important neurotransmitter in the nervous system that regulates the contractility of muscle fibres and is responsible for maintaining focus and fast reaction time. Rhodiola rosea extract – an extract of a plant with adaptogenic properties that helps the organism to adapt to stressful conditions. By inhibiting the breakdown of neurotransmitters, it reduces the level of fatigue and improves well-being, that way helping to extend your workout session. During training, the extract can reduce the damage of muscle fibres and lactic acid production, that way stimulating glucose consumption by the skeletal muscles. It can also reduce cortisol levels, which helps the organism to relax and improves the process of post-workout regeneration. Calcium alpha-ketoglutarate – participates in the process of energy production in the Krebs cycle and nitrogen transport in the body. It inhibits the breakdown of muscle fibres and promotes the synthesis of new proteins, increasing the activity of GH and insulin-like growth factor, as well as improves arginine assimilability. By stimulating collagen synthesis, it promotes the process of regeneration and wound healing as well as supports the normal functioning of the nervous system. When combined with calcium, it helps to regulate phosphorus and calcium levels in the body, which are responsible for maintaining proper bone density. Maltodextrin – a complex sugar whose low-molecular-weight polymers make it easily digestible and prevent digestive problems. It ensures long-lasting and stable release from the digestive system, providing highly accessible energy during physical activity. Additionally, the producer enriched the product with folic acid. Also called vitamin B9, folic acid determines the normal activity of the nervous system and the correct course of the methylation process that regulates many processes essential for the body, including the production of ATP and the synthesis of DNA and RNA. It participates in the process of production and maturation of red blood cells, responsible for oxygen transport in the organism. It participates in DNA synthesis and exhibits antioxidant potential. To sum up, Scitec Pow3rd! 2.0 is a complex pre-workout supplement increasing the body’s exercise abilities. The combination of two forms of creatine guarantees fast ATP resynthesis and, as a result, efficient energy production, which translates into higher athletic performance. The preparation also boosts NO production, delays the occurrence of fatigue, regulates pH levels, and helps to maintain good mental shape. It has a beneficial effect on energy levels, muscle strength and power, and can help to improve body composition. Mix one portion with 250 ml of water and drink 30-60 minutes before training or before an important physical or mental activity. The product should not be used for a period exceeding 8 weeks, as the body can develop tolerance to its active ingredients. Preferably, discontinue use for one or two weeks and then resume supplementation. Because of caffeine content, it is not recommended to take the supplement 4-6 hours before bedtime, as it can prevent you from falling asleep and decrease sleep quality.